Settlers began arriving at this site in the late 1860s, mostly from the nearby settlement of Porter's Bluff, which had been devastated by a flood in 1866. By 1872, the Houston and Texas Central Railroad, which bypassed Porter's Bluff, was routed through this site. One of the railroad's principal investors, Houston businessman William Marsh Rice (1816-1900), donated five hundred acres of land for a station and a townsite, which was named in his honor. 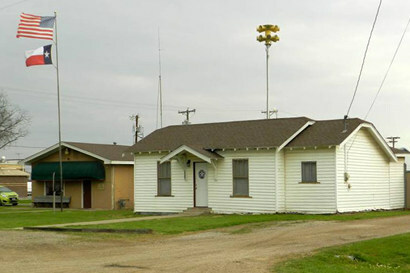 The Rice Post Office was established in 1872. Cotton was the main crop of the area, and accounted for much of the community's business interests. 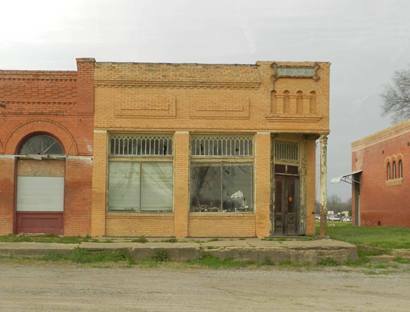 One of the first businesses in Rice was a cotton gin, and the Rice Railroad Station was a major cotton shipping point. A train carrying Spanish-American War recruits came through the station in 1898, and the Liberty Bell passed through on a World War I Liberty Bond campaign. Early settlers of Rice included Isaac Sessions, who arrived in 1846; Texas Revolutionary War veteran Joseph Calloway Bartlett, who was Rice's first postmaster; and many Civil War veterans. 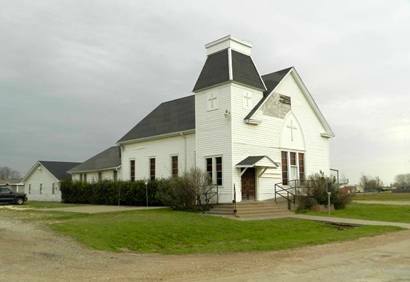 The community's first school opened in 1875. Citizens voted to incorporate the city in a December 1912 election. 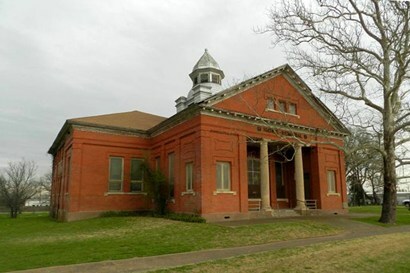 The Rice community was settled during the late 1860s and was named for William Marsh Rice, who donated land for the town's railroad station and later founded Rice University. 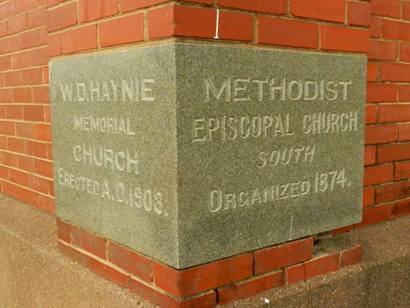 In 1868, the citizens of the community were granted land for a cemetery by the trustees of the William M. Rice interests. Originally located about one and one-half miles south, the Rice Cemetery was removed to this site during the 1870s. The three original cemetery trustees, William D. Haynie, John A. Clopton, and Isaac B. Sessions, are buried in the oldest, or northern, section of the graveyard. That section also contains many burial sites that are marked only with small rock fragments or similar material. Rice Cemetery contains marked graves of numerous war veterans, including that of Joseph Calloway Bartlett, a veteran of the Texas War for Independence. In addition, four participants in the Civil War, two Spanish-American War veterans, and numerous World War I and II veterans also are interred here. Tombstones reflect the high infant mortality rate of the 1880s and the early 20th-century flu epidemic. 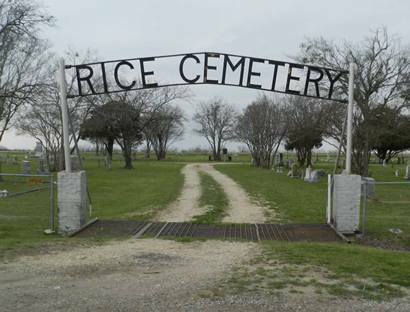 A good example of a pioneer graveyard, the Rice Cemetery is an important part of Navarro County's recorded history. In the shadow of the Metroplex (if the sun rose in Oklahoma) lies the little town of Rice. The town's namesake is the same William Marsh Rice that the university in Houston was named after. He was later murdered in New York City (the Valet did it). Rice came to Houston in 1837 nearly penniless and by 1860 was the second richest man in Texas. 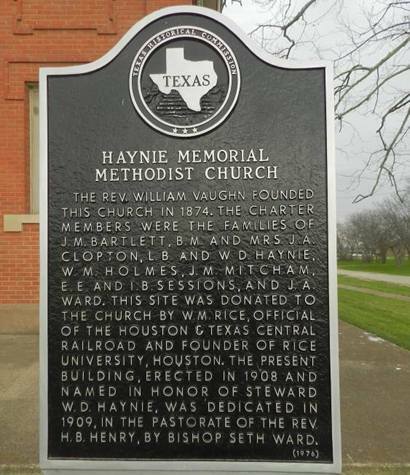 One of his major interests was railroading and when the Houston and Texas Central ran a line to Dallas, he gave the land for the town's church and cemetery. Being this close to Dallas doesn't help Rice's economy at all. People en route to Houston don't need to stop this soon, and travelers from Houston figure they can wait. If they can't, then they'll more than likely stop at Corsicana or Ennis. We stopped because that's what we do. 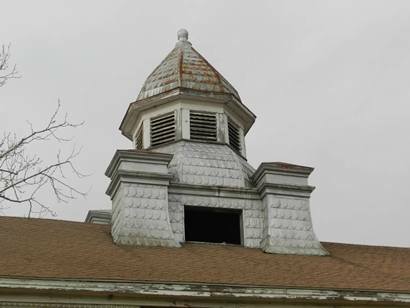 We saw the water tower and the silver dome that suggested a pocket-courthouse. We weren't hungry, but we were curious. 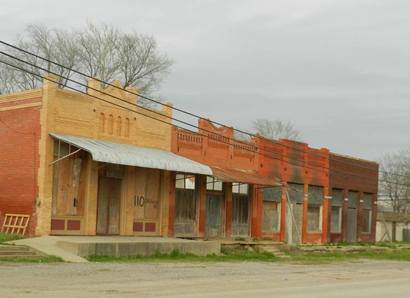 "Downtown" Rice lost nearly half of its buildings in a devastating fire in 1901. What remains is a picturesque row of brick buildings with a few scattered around the immediate area. From the raised brick sidewalk on the north side, you can look over a lush Spring landscape where the other half of the main street once was. Midway in the block is a small and charming business open only since December 1999. The darkened storefronts on either side might make it resemble a bar, but it's actually an ice-cream emporium/grill. This is The Rice City Grill. The sign mounted in the back of a truck will make sure you don't miss it. The front door was propped open with a twelve-pound pipe wrench and the door's hardware had the unnecessary elegance of the early 1900s. The proprietress was a gamin-like young woman named Raina Clawson. Husband Rodney was busy in the back. At the time of our visit we thought he might've been "the hired man." People often mistake busy husbands for hired help. Even wives. Maybe he was busy looking for his wrench. As we entered, a brother-sister team was spooning vanilla ice cream into their mouths as fast as they could without getting "an ice-cream headache." As young as they were, they knew that if it's a beautiful Spring day, then Summer will be here tomorrow. We had assumed they were Clawson children, and they're certainly polite enough that anyone would want to claim them, but a later phone call to Rodney identified them as "regular customers." If you're lamenting the passing of places like this, then stop lamenting and pay them a visit. You can show your kids what small towns were like while you remember what it was like with brick sidewalks, screen doors, and ice cream that needed to be eaten before summer. I ran across your website that had some information on Rice TX and I read the article from Robert Erisman IV about a man who got his arm cut off in the cotton gin. Yes that did happen, it was my grandfather, his name was Jack Leach, he ran the cotton gin for brothers J.B & James Fortson for over 40 years. He lived in the house on the same property. When I was a child we would play in the cotton seed barn until we would get in trouble, then back again as soon as we could. It was so much fun growing up there. You could ride your bikes or horses anytime or anywhere and didn�t have to worry about anything. The stories about Bonnie & Clyde I am not sure about robbing the bank but I do know they stayed at the hotel that used to be downtown, there was pictures at one time in the Pioneer Village in Corsicana of them there. I am a resident of Rice, Tx. I read your article about your visit to Rice,Tx. in 2000. I really enjoyed reading it. I am sad to inform that the Rice City Grill is no longer in business, but I was wanting to write and let you know about my mothers business that she has recently opened here. Rice finally has a flower and gift shop and she really is doing well. My mothers name is Irene Lopez and it has always been her dream to have a flower shop in Rice, as this is where I grew up. The shops name is LeFleur Floral & Gifts. This is a nice addition to such a small town. The building where she is located was once the Rice Bank many, many years ago. It is also rumored that the Bank was once robbed by Bonnie and Clyde, (would like to know the truth to that one). My name is Robert Erisman IV and I live in Chatfield next to Rice and I have a little information about Rice History. A woman who goes to my church, who is very old, told me [about] that the old Cotton Gin that mean kids mess around in and destroy things in. Well, [she said] that some man who she knew who was the owner back in 1915 or something like that was working in there and the machine stopped and so he tried to fix it and it started back up and killed him or cut his arm off. I'll try and find out more information about that accident.